If you had a food truck, you are suggested to constantly change your location in order to catch as many sales as possible. But this also makes it harder for your potential customers to know where exactly you are. The problem would even be bigger if you already have some loyal clients who like your stuff and are eager to buy from you on a regular basis. If they can’t find you every time they would want to purchase your products, their loyalty will quickly expire. This probably is a major issue for every truck shop… Well, at least it had been till not a long ago, not anymore. The two entrepreneurs Derek Kean and Matthew Berkland have created the ultimate marketing solution for you. This bright and innovative business idea is called Truckily. This is a mobile application with which you can constantly update your customers for the exact position of your food truck. Actually, you don’t need to do anything to share your location. If you have Truckily, this will happen automatically. Every time your position changes, it will be shared on major social networks and your clients will be able to see a convenient Google map on their mobile devices. This is how all of your social followers and fans will know where exactly you are at any part of the day. Every time someone wants to have again some of your delicious ice cream, she will be able to find you with a click or two and even run a navigation to your store. In today’s world marketing is crucial for any business and Truckily is undoubtedly a great marketing tool for any traveling merchant operating a food truck. 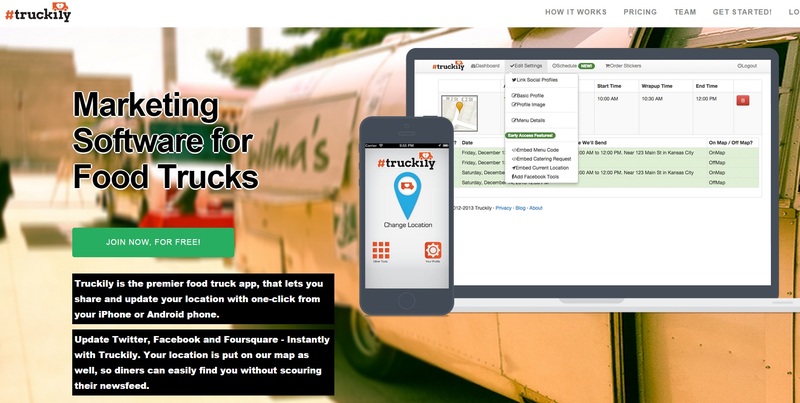 Truckily is an innovative web and online marketing tool for food trucks. Did you like this great business idea? You can share it with friends and help our site publish many more like it. Also, don’t miss checking out some more of our cool startup stories.